Occupational lung diseases are an important public health issue and are avoidable through preventive interventions in the workplace. Up-to-date knowledge about changes in exposure to occupational hazards as a result of technological and industrial developments is essential to the design and implementation of efficient and effective workplace preventive measures. New occupational agents with unknown respiratory health effects are constantly introduced to the market and require periodic health surveillance among exposed workers to detect early signs of adverse respiratory effects. In addition, the ageing workforce, many of whom have pre-existing respiratory conditions, poses new challenges in terms of the diagnosis and management of occupational lung diseases. Primary preventive interventions aimed to reduce exposure levels in the workplace remain pivotal for elimination of the occupational lung disease burden. To achieve this goal there is still a clear need for setting standard occupational exposure limits based on transparent evidence-based methodology, in particular for carcinogens and sensitising agents that expose large working populations to risk. The present overview, focused on the occupational lung disease burden in Europe, proposes directions for all parties involved in the prevention of occupational lung disease, from researchers and occupational and respiratory health professionals to workers and employers. In recent decades, important changes in the industrial structure of Europe have altered the profile of occupational exposures to respiratory hazards and therefore shifted the burden of occupational respiratory diseases. In addition, the European workforce has changed: it has become older, reflecting ageing of the general population, and more “vulnerable” because of the increased prevalence of individuals with chronic respiratory diseases, both entering and remaining in the workforce, and of low-socioeconomic-status migrant workers. Finally, the leading preventive role of governmental organisations via legislative regulation and surveillance has progressively diminished in favour of an increased emphasis on the responsibility of both employers and employees. All these changes pose new important challenges that require new strategic responses from healthcare professionals, in particular occupational and respiratory physicians, and from other experts in the field. The purpose of this review is to propose some directions for research in the area of occupational respiratory diseases as well as new requirements for the support of healthcare professionals, and to identify regulatory needs in Europe. Across Europe there have been major shifts in the main sources of occupational exposure to respiratory hazards, from high exposures to mineral dusts at the beginning of the 20th century in large centralised industries (such as coal and silica dust in the mining sector and metal production) to low-dose allergens (e.g. flour and enzymes in bakeries and food-processing industries) and irritants (e.g. cleaning agents) at present . Correspondingly, this has led to major shifts in the burden of associated respiratory diseases over recent decades. Pneumoconiosis, mainly associated with high-level coal mine dust exposure, was the most prevalent occupational lung disease after the Second World War. Increased mechanisation and automation in the mining industries and foundries and the implementation of efficient preventive exposure control measures then reduced dust exposure levels and thus the associated respiratory disease burden. In addition, the mining sector overall has been shrinking in the majority of European countries, a process hastened by recent climate change mitigation policies aimed to decrease environmental fossil-fuel carbon emissions. Nowadays, the most frequently reported occupational respiratory disease is occupational asthma, with an incidence of 2–5 cases per 100 000 population per year, corresponding to about 15–20% of the overall adult-asthma public burden, mainly associated with allergy to high-molecular-weight (e.g. wheat flour in baking) or low-molecular-weight (e.g. di-isocyanates in spray painting) respiratory sensitising agents [2, 3]. 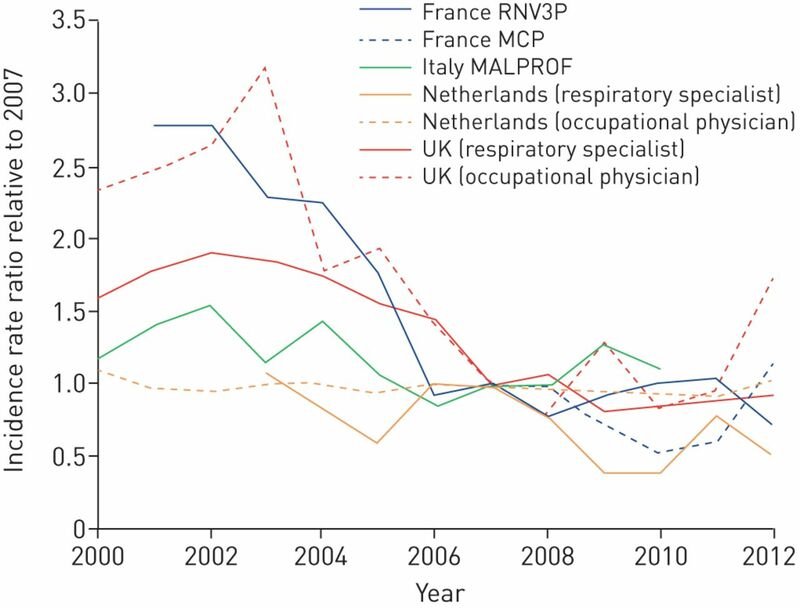 Nevertheless, in Europe, an overall decline in occupational asthma incidence is reported (figure 1) . However, these figures are based on national occupational disease registries and voluntary reporting surveillance schemes, so they could also be underestimates of the true disease burden and reflect a reduction in surveillance or access to healthcare, with workers choosing not to seek advice due to poor job security, or reporter fatigue. In addition, an epidemic of non-allergic asthma symptoms has been reported in the past decade in Europe among cleaners  and, although some potential causal agents have been reported (e.g. chlorine), uncertainty persists around its aethiopathogenesis. Irritant-mediated causal mechanisms have been hypothesised , posing new challenges in terms of the diagnosis and prevention of related respiratory effects, and more research (including better exposure assessment methods) is needed . To complicate this scenario, the constant development of new products (e.g. paints, glues, biocides, detergents, etc.) continuously introduces to the market potential unknown respiratory hazards, both as sensitisers and irritants, able to cause, or at least exacerbate, asthma among workers. Estimated annual changes in incidence of occupational asthma in Europe based on national reporting surveillance data. RNV3P: Le Réseau national de vigilance et de prévention des pathologies professionnelles; MCP: Programme de surveillance des maladies à caractère professionnel (French surveillance system); MALPROF: Malattie Professionali (Italian surveillance system). Reproduced and modified from  with permission. For some respiratory diseases, such as chronic obstructive pulmonary disease (COPD), it is more difficult to estimate the specific contribution of occupational exposures because of the strong causal association with tobacco smoking and the late onset, often after retirement age. Nevertheless, about 15% of all COPD cases in Western societies have been attributed to exposure to vapours, gas, dust or fumes, mainly based on past occupational studies in the highly exposed mining, textile and farming sectors . In addition, recent large population-based epidemiological studies that have been able to control for smoking and other potential confounding factors, such as asthma, have found occupations at increased COPD risk even at lower community exposure levels . Furthermore, it has been reported that occupational exposures, such as to vapours, gas, dust or fumes, might trigger COPD exacerbations in a similar way to that in which they elicit asthma attacks [9, 10]. Given the high prevalence of COPD in the general population, further well-designed longitudinal studies are needed to better evaluate the work-related burden. In relation to malignant occupational respiratory diseases, asbestos-related diseases (mainly pleural malignant mesothelioma and lung cancer) still represent most of the occupational cancer burden and the main and increasing cause of mortality for occupational respiratory diseases in Europe and in the world (figure 2) . It has been estimated recently that, globally, 155 000 lung cancer and 23 000 mesothelioma cases were attributable to asbestos in 2015 . Although asbestos has been banned in most of Europe since the late 1990s and a European Directive banned almost all remaining uses of chrysotile asbestos after January 2005, the legacy from the past 50 years of massive production and use remains considerable because of the very long disease latency times. It has been estimated that the burden of asbestos-related cancers will peak in 2020–2030 in most European countries, depending on the local pattern of asbestos extraction and use . Considering pleural mesothelioma alone (>90% attributable to asbestos exposure), it has been estimated that in Europe about 250 000 people will die by 2030 (one in 150 men born between 1945 and 1950); subsequently, the incidence and hence mortality is expected to fall . It is notable that, in Nordic countries like Sweden where the asbestos ban was implemented earlier (1970s to 1980s), the first signs of a reduction in pleural mesothelioma occurrence seem to be appearing already . Mesothelioma and related asbestos-related lung cancer mortality by country, 1979–2012. Reproduced and modified from  with permission. For occupational lung cancer, the most frequently quoted population attributable estimate is about 9% (15% in men and 5% in women) , although higher estimates have been reported (24% overall, 29% in men and 5% in women) according to specific times and past levels of exposure to lung carcinogens (mainly asbestos) . A prospective cohort study in the Netherlands estimated that about 12% of cases of lung cancer in men were attributable to lifetime occupational asbestos exposure, after adjustment for smoking and diet . Moreover, a recent large pooled analysis of mainly European case–control studies showed that the joint effect of asbestos and smoking exposure was more than additive in all lung cancer subtypes in both men and women . The total burden of lung cancer cases attributable to work-related exposure to respiratory carcinogens in Europe has been estimated to be 32 400 cases per year . Estimates of the prevalence of exposure to the main respiratory carcinogens by industry sector in Europe based on the CAREX (CARcinogen EXposure) database are given in table 1 . 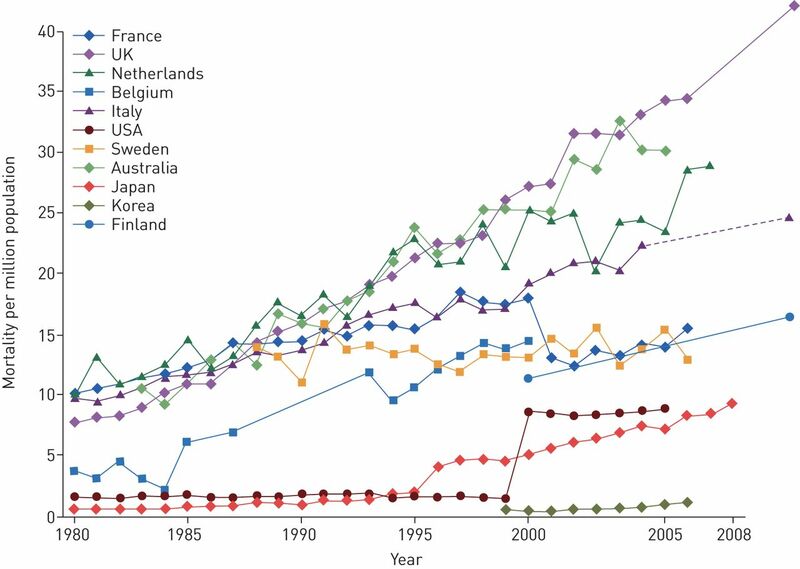 A recent large pooled analysis of case–control studies on lung cancer (the SYNERGY project), which made use of more than 100 000 quantitative exposure measurements, showed that exposure estimates are still high but there have been decreasing exposure trends from the 1970s onwards . Nevertheless, for some carcinogens, like crystalline silica, exposure is known still to be a major issue in specific industry sectors such as the construction industry [21, 22]. Therefore, construction remains the sector with the highest lung cancer burden. In the UK alone it has been estimated that over 40% of the occupational cancer deaths and cancer registrations, corresponding to about 3500 cases per year, are attributed to past exposure to asbestos and silica in this sector, mostly causing lung cancer and mesothelioma . The rapid growth in life expectancy by almost 4 years in the past two decades in most European countries is a great demonstration of the successes in prevention and care in achieving healthy ageing. In response to ageing societies, many countries have enacted policies to increase labour force participation among older workers and to extend the statutory retirement age to 67 years and beyond. Current policies seldom take into account how respiratory diseases and working conditions will have an impact upon the ability of older workers to remain in paid employment until a statutory retirement age. In fact, there is a concerning lack of evidence over which individual-, work- and disease-related factors play a role in premature displacement from the labour market and what interventions are needed to counteract the adverse consequences of disease for labour force participation. There is a clear need for research aiming to develop strategies to support the ability to work for older workers with chronic diseases. Work-related disability is one of the most important routes of displacement from the labour market. In a recent systematic review, workers with respiratory disease at enrolment across five longitudinal studies had 2.4 times higher risk of disability pension during the follow-up period . The consequences for working careers can be large, as illustrated in the Norwegian disability register where persons with a benefit for respiratory diseases lost approximately 11 working years before the age of 67 years . There is emerging evidence of a combined and more than additive interaction effect of occupational exposure and respiratory disease on ability to work. In the European Community Respiratory Health Survey (ECRHS) II among 11 European countries, subjects who reported physician-diagnosed asthma and held jobs with regular exposure to biological dusts, gases or fumes had a 3.5 times higher likelihood of job change due to respiratory health problems during 7 years of follow-up . In another study, again based on the ECRHS, significant associations were observed between exposure to occupational asthmagens and the presence of uncontrolled asthma . The importance of working conditions is not, however, limited to the classic allergens. A longitudinal study among over 8000 Dutch workers aged 45–64 years showed that higher autonomy, higher support and lower psychological demands at work considerably reduced the risk of a disability benefit due to respiratory health problems. This finding indicates that working conditions that increase coping possibilities at work can modify the association between respiratory disease and labour force participation . A recent study among 300 adults with asthma demonstrated that subjects with uncontrolled asthma had substantially higher sickness absence and lower productivity while at work than those with asthma controlled by medication. The presence of psychological distress at work seemed to increase the impact of asthma on work performance . This emerging evidence strongly suggests that we need more insight into the complex interaction between respiratory disease and the work environment, because the various factors at work may lead to worsening of prognosis and lack of symptom control, even when these factors do not play a role in the onset of respiratory disease. Work-related factors are in essence modifiable, and thus are primary targets for intervention and treatment plans. It comes as a surprise that there is little to no attention given to work as a modifying factor in international guidelines for the management of asthma or COPD in Europe [30, 31]. Likewise, it remains a challenge to incorporate work-related issues in clinical guidelines for the management of respiratory diseases. Different emerging hazards exist for respiratory diseases in the work environment. The most obvious are the new emerging exposures resulting from recent technological developments. One example is manufactured carbon nanotubes (MCNs), which are increasingly being used, and the rapid introduction of new products based on other nanomaterials. A substantial proportion of workers are exposed, for example in research and development departments and in primary manufacture, but exposure levels among employees are still poorly characterised . In addition, it has been reported that laser printers and photocopiers might be a potential source of nanoparticles [33, 34]. Nanoparticulates are well studied in terms of their toxicology (i.e. the hazard), but the human exposure and resulting respiratory health risks remain poorly understood. In 2014, the MCN known as Mitsui MWCNT-7 was classified as possibly carcinogenic to humans (Group 2B), and it is well documented in animal studies that MCNs can cause inflammation and fibrosis, but no data exist on the possible disease burden in humans [35, 36]. In addition, the expansion of biotechnologies (including genetic manipulation) to a broad variety of industry sectors, including food, detergents, chemicals, paper and pulp production, agriculture and textiles, potentially introduces new respiratory hazards that are difficult to identify and causally link to respiratory health effects. As indirect evidence, every year specific new causes of occupational asthma are being reported, underlining the need for health-based risk assessments when new materials are introduced or used in different ways or combinations . This is crucial in the healthcare sector, where a more integrated approach is needed to ensure effective environmental surface cleaning and disinfection while protecting the respiratory health of both healthcare workers and patients . To support this risk assessment, validated algorithms to predict the potential hazard of an agent (being a respiratory sensitiser and so a potential asthmagen) on the basis of its molecular structure are available . Furthermore, as aforementioned in relation to cleaning agents, it is increasingly recognised that irritant exposures might contribute significantly to the burden of work-related asthma . Another example of this potential causal mechanism is the identification of clusters of “non-allergic” asthma cases associated with exposure to specific low-molecular-weight pesticides in pesticide production . Therefore, to ensure early identification of new occupational respiratory hazards, continuous respiratory health surveillance of workers is key in order to allow early detection of disease outbreaks at work and thus the identification of the underlying causal agents. As a supporting recent example, diacetyl (2,3-butanedione), a volatile butter-flavoured diketone, was identified as a new cause of serious disabling bronchiolitis obliterans because several workers from popcorn-producing industries ended up on lung transplant lists . The occurrence of bronchiolitis obliterans was subsequently confirmed in other industries where diacetyl is produced or used, such as those making potato chips and cookies . Another recent example is the identification of a cluster of lung fibrosis, emphysema and pulmonary alveolar proteinosis in indium-tin oxide (ITO) workers in the growing manufacture of flat-panel displays (e.g. liquid-crystal or plasma screens for televisions) [43, 44]. Of note, ITO has recently been classified by the International Agency for Research on Cancer (IARC) of the World Health Organization as a possible carcinogen (Group 2B) based on sufficient evidence in experimental animals, so tighter exposure control measures at the workplace should be warranted . In relation to re-emerging exposures to traditional occupational respiratory hazards, crystalline silica is an important example, given that in Europe an estimated 3–5 million workers are exposed. It is well documented that silica can cause interstitial lung disease (i.e. silicosis) among highly exposed workers in the mining and construction sectors, but clusters of silicosis outbreaks have also been reported recently in other manufacturing sectors (e.g. kitchen worktops production) that use so-called “engineered stones” (composite materials made of crushed stones, mainly quartz and marble, bound together by a resin adhesive). The high exposure to respirable silica is mainly generated by abrasive processes (i.e. grinding, polishing, drilling and crushing) of these new artificial materials using modern high-speed hand tools [46, 47]. Another dramatic example is the recent outbreaks of silicosis among workers sandblasting jeans to give denim a “worn” look [48, 49]. In addition, the causal association between exposure to silica dust and COPD or lung cancer has gained increased attention mainly in the rapidly mechanising construction industry. Debate still exists on exposure–response relationships and hence the “acceptable” threshold of occupational exposure, given that silica is a known lung carcinogen . In a recent systematic review and meta-analysis, “ever” exposure to crystalline silica was associated with significant decline compared with “low/no” exposure in the mean predicted forced expiratory volume in 1 s (FEV1) (−4.62%, 95% CI −2.06% to −7.18%) and FEV1/forced vital capacity (−0.41, 95% CI −0.28 to −0.54), revealing airway obstruction consistent with COPD, but no pooled exposure–response trends for cumulative exposure to silica were estimated . In a recent health impact assessment it was estimated that about 1 million COPD cases in Europe would be prevented if a 90% compliance with a 0.1 mg·m−3 occupational exposure limit (OEL) for respirable crystalline silica could be achieved . However, a recent study has estimated that, to prevent silica-related lung cancer cases, exposures should be further reduced. An OEL of 0.05 mg·m−3 (assuming full compliance) should be applied to prevent 110 000 of the 470 000 silica-related lung cancer cases predicted between 2010 and 2069 in Europe . Worryingly, indications exist of a resurgence of pneumoconiosis in coal workers, even in countries with strict occupational health and safety regulations such as the USA, probably due to lack of exposure control measures in an increasing number of small private mines [54, 55]. The same phenomenon may be anticipated in some Eastern European countries, such as Poland, where coal mining is still an important part of the energy sector . Other re-emerging traditional respiratory occupational hazards are biological agents, including bacteria and moulds and their toxins (e.g. endotoxin). For example, exposures to endotoxin are known to be high in agricultural production, and recent intensification of livestock and plant production combined with more frequent flooding has contributed to an increase in bio-aerosol exposure levels . What is new is that exposure to these bio-aerosols has also been reported in emerging sectors such as waste treatment and recycling, biotech food production and processing industries, requiring new focused preventive and surveillance strategies. Work-related asthma includes two major types of disease: occupational asthma, which is caused by work, and work-exacerbated asthma (WEA), which is made worse by conditions at work. Both occupational asthma and WEA are common, with an estimated population attributable risk for adult-onset asthma of 16.3%  and a prevalence of 21.5% for WEA among adults with asthma . In the large European survey ECRHS II, the population attributable risk for WEA was 14.7% among workers with current asthma, corresponding to about one in seven cases of severe asthma exacerbation in a working population . WEA is associated with adverse clinical and socioeconomic outcomes. Compared to occupational asthma cases, WEA cases tend to be as or more severe [61–63], as likely to be unemployed and lose income , but less likely to submit a claim for compensation [61, 64–67]. Furthermore, recent evidence suggests that both WEA and occupational asthma cases differ from non-work-related asthma cases by taking more sick leave , as well as using healthcare more often and thus causing higher direct costs . WEA will probably continue to be a problem in industrialised countries because the risk pool among working adults is large and the relevant exposures are common. Specifically, among the 28 European Union (EU) countries, a median of 6.5% of working-age adults (aged 18–44 years) have ever had asthma, with higher values in the north and west . Concerning workplace asthma agents, a recently developed asthma-specific job exposure matrix assessed 399 (47.5%) out of 840 detailed occupations as having probable exposure to at least one asthma agent . Also, emerging technologies could provide new opportunities for asthma-related occupational exposures. For example, additive manufacturing, or three-dimensional printing, is a new technology that is affordable and used in dispersed locations that do not necessarily have adequate exposure controls. The devices generate ultrafine particles , and their feed materials can include polymers (e.g. acrylonitrile butadiene styrene) and metals (e.g. cobalt) that are known or suspected asthmagens. A variety of prevention efforts are needed to limit the occurrence and severity of WEA. The vast majority of current OELs are not intended to prevent exacerbation of asthma and do not support the primary prevention of WEA. New OELs that better accommodate workers with asthma and other allergic conditions would address this gap in protection. For secondary and tertiary prevention, it is important to continue training primary-care and respiratory physicians to identify and manage work-related asthma cases, especially in locations where occupational health services have been reduced. Heath surveillance and workers' exposure monitoring programmes would facilitate the early identification of cases and bring to attention new workplace agents, as well as old agents in new settings, that exacerbate asthma . Studies of intervention activities are needed to document effectiveness and inform evidence-based recommendations for prevention. Management of persons with lung diseases in the workplace is crucial in order to maintain a good working life, in particular for workers with a chronic respiratory disease. It appears that reduction of exposure cannot always be recommended as an alternative to cessation of exposure in the management of occupational asthma , but our knowledge remains limited and the adverse social and maybe health consequences of leaving a job always have to be taken into account. Individual susceptibility has several dimensions. First, some individuals are more susceptible to occupational respiratory hazards because of differences in their genotype that result in phenotypical differences. Many examples exist of gene–environment interactions for exposures that occur in the work environment in relation to respiratory diseases. For instance, human leukocyte antigen (HLA) II genetic variants (such as the DQB1*0503 allele) have been reported in association with susceptibility to sensitisation to di-isocyanates and subsequent risk of occupational asthma . Nevertheless, the evidence is not consistent and, even if confirmed, poses important ethical dilemmas in genetic screening among workers . Secondly, individuals with pre-existing respiratory diseases, who previously did not enter the workforce, are now becoming part of the workforce because of an increased life quality and expectancy, partly due to the availability of more effective medical therapies. Often, individuals with pre-existing respiratory diseases are more likely to develop symptoms resulting from occupational exposures. Two examples can be given. 1) New treatments for cystic fibrosis have increased the longevity of cystic fibrosis patients and there is now a need for employment of these patients. Laborde-Castérot et al. studied the employment history of young adult cystic fibrosis patients with mean±sd age 31±9 years. Of the 207 patients investigated, 117 were “in job”. Cystic fibrosis patients had a higher educational level than the general population and proportionally more were in skilled employment. Their lung function and educational level were both positively associated with employment rate. 2) Homozygote α1-antitrypsin deficiency is a known hereditary cause of early COPD, and genetic counselling has been instituted for families with this disease in most countries. However, it is an overlooked fact that inflammatory effects like bronchial hyperresponsiveness or symptoms caused by occupational exposures are more often seen in heterozygotes than in persons with the normal wild-type genotype [77, 78]. Given the relatively high proportion of carriers of the deficiency allele (mainly the “PiZ” allele) in Northern Europe, corresponding to more than 7 million heterozygotes, this genetic risk factor for bronchial hyperresponsiveness and subsequently asthma and COPD needs more attention . Furthermore, key exposure time windows in a person's life course can play an important role in determining the individual susceptibility to occupational respiratory hazards. It is increasingly recognised that exposures early in life partly determine lifelong health, for example by affecting adult lung function . Recently, transgenerational effects have been suggested, for example maternal exposures during pregnancy; in particular, maternal stress [81, 82] and maternal exposure to asthmagens  seem to increase the risk for allergic disease among offspring. Even fathers' occupational environment before conception might be of importance . In addition to internal or inherent factors that may affect individual physical “susceptibility” to workplace hazards, external or acquired factors can also modify individual “vulnerability” to workplace hazards. In particular, “immigrant status” could represent an occupational health risk factor, in particular in low-wage and low-skilled occupations, such as agricultural production . These jobs typically involve greater health and safety risks but draw immigrant workers because, due to low skills, less formal education and limited language proficiency, they might have no other alternative work in the hosting country. Therefore, an economic need to work, coupled with fear of deportation, has fostered a more vulnerable workforce that is less likely to report unsafe working conditions and labour violations. In particular, immigrants are more likely to work extra shift hours, with higher-rhythm, heavier workloads in the riskiest job duties, often in unprotected conditions, without appropriate education and training. In addition, in the case of any health issue, they are less likely to seek medical attention and often have no access to standard healthcare . These factors underscore the need for a systematic approach to occupational health and safety that addresses both immigration policy and regulations related to worker safety and health. In the EU, exposure to chemicals in workplaces is regulated under both Occupational Safety and Health (OSH) legislation and EU chemicals legislation. Under OSH, the Chemical Agents Directive (98/24/EC) obliges employers to identify all chemical hazards in the workplace, carry out exposure and risk assessments, and act on them. The Directive establishes a general legal framework to set indicative or binding OELs as well as biological limit values at the community level. The principles of protecting workers from the risks related to exposure to carcinogens or mutagens at work are set out in the Carcinogens and Mutagens Directive (2004/37/EC). Under this Directive, binding limit values are given for carcinogens. Of note, indicative limit values are always health-based, but binding limit values also take into account socioeconomic and technical feasibility factors. Thus far, there are approximately 150 indicative limit values, but only five binding limit values. Two of these binding values involve the respiratory carcinogens asbestos and hard wood, of which the latter urgently requires an update. IARC Monographs on the Evaluation of Carcinogenic Risks to Humans have so far (including the upcoming volume 118) classified 120 agents or exposure circumstances as carcinogenic to humans (Group 1). Of these, at least 58 are primarily occupational carcinogens and most are respiratory carcinogens, some with a high number of exposed individuals, also in the work environment. In the UK, for example, based on cancer registrations in 2004, it was estimated that 85% of cases are associated to the 10 occupational carcinogens with the highest prevalence of exposure (figure 3) [11, 23]. These are likely to be underestimates, given that only about 2% of chemicals in commerce have been adequately tested for carcinogenicity . 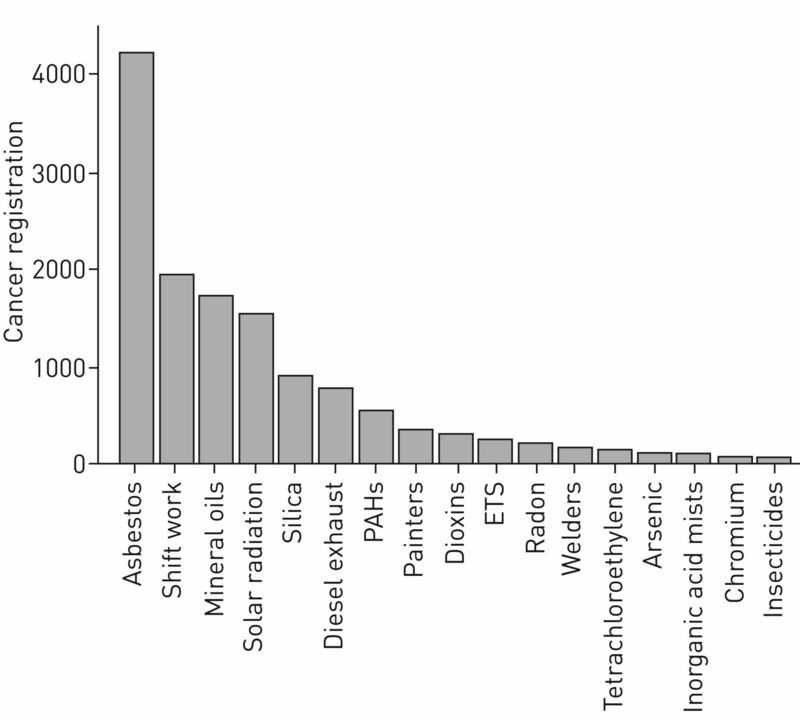 Number of cancer cases from cancer registrations attributable to the most prevalent occupational carcinogens in the UK in 2004. 85% of the cancer cases were attributable to the top 10 chemical agents. PAHs: polycyclic aromatic hydrocarbons; ETS: environmental tobacco smoke. Reproduced and modified from  with permission. In addition to EU OELs, many countries have their own national system for occupational limit values. The main problem with national values is that they may vary considerably from country to country, which reflects differences in risk policy and risk assessment methodologies or the influence of socioeconomic feasibility considerations . EU Regulation 1907/2006 for the Registration, Evaluation, Authorisation and Restriction of Chemicals (REACH) covers chemical substances imported, manufactured or used in the EU. REACH does not interfere with existing occupational health and safety requirements but is meant to be complementary to OSH legislation. REACH introduces new limit values, DNELs (Derived No Effect Levels), which may be set for both workers and the general public. These are used in risk characterisation to determine adequate control for specified uses. Like OELs, they are based on the evaluation of available toxicological and epidemiological data regarding dose–response relationships. DNELs are primarily set by industry and in many cases they may significantly differ from existing OELs [88, 89]. Substances classified as carcinogenic, mutagenic or reproductive toxicants (category 1A or B) under the CLP regulation (1272/2008/EC for Classification, Labelling and Packaging of substances and mixtures) may be included in the list of substances of very high concern (REACH regulation Annex XIV). These substances cannot be used without authorisation from the European Commission. Authorisation requires that companies demonstrate safe conditions of use and explore the possibilities for substituting the substance in the future. For example, hexavalent chromium compounds, known respiratory carcinogens, are authorised under REACH. It should be noted, however, that REACH does not cover process-generated dusts and fumes (e.g. diesel and welding fumes), even if these agents are responsible for the largest respiratory disease burden. This means that, although the use of hexavalent chromium compounds, such as in the surface treatment of metals, is authorised under REACH, the authorisation process does not cover hexavalent chromium formed during welding or stainless-steel manufacturing. Of note, IARC has recently upgraded welding fumes from possibly (Group 2B) to carcinogenic to humans (Group 1) based on new observational and experimental studies , making the definition of an agreed OEL an even more urgent issue. Regrettably, in most EU countries, respiratory carcinogens with a high public health impact and burden of disease (e.g. hexavalent chromium, silica and diesel fumes) only have indicative OELs or, in some cases, such as diesel, no OELs at all. In addition, OELs are not regularly updated. There is a need for updated and evidence-based OELs for agents with a high public health burden. Some work is under way to increase the number of binding limit values in the EU, but this needs higher priority. For instance, in 2005, the European Scientific Committee for Occupational Exposure Limits (SCOEL) reported that an OEL for respirable crystalline silica should be below 0.05 mg·m−3 over a work shift . However, an exposure level around 0.05 mg·m−3 is still associated with an excess lung cancer risk for the cristobalite form of silica of over 5% . This is much higher than risk values accepted in most countries, which lie in a range of excess lifetime risks of one in 250–25 000 after 40 years of occupational exposure. No update has been published since. Therefore, agreement on acceptable risk levels is urgently needed. Chemicals classified as respiratory sensitisers may also be added to the REACH authorisation list. Thus far, no substances have been added to the list because of their sensitising properties, although the addition of two sensitising acid anhydrides has been considered . Di-isocyanates represent a group of important sensitisers for which it is difficult to identify a threshold for their sensitising properties. It has recently been proposed to restrict their use under REACH, unless certain specific conditions, such as for handling and training, are applied . In general, the REACH restriction process can be considered a “safety net” to control chemical risks not adequately controlled by other processes. Respiratory sensitisers do present a challenge for setting OELs. For example, the SCOEL evaluated flour dust in 2008 and concluded that it is not possible to recommend a health-based OEL for it, as no threshold can be identified for its sensitising effects . Thus, no indicative OEL value can be set for flour dust. On the other hand, exposure–response relationships have been established over the past few decades for many sensitising agents [95–97]. This evidence supports the hypothesis that even if “No Observed Effect Levels” cannot be defined, the risk can be reduced by lowering the exposure levels. In the Netherlands, exposure standards have been proposed for wheat flour, soy dust and fungal α-amylase by calculating the level of exposure at which the lifetime risk for developing sensitisation is 1% maximally on the basis of published exposure–response relationships for sensitisation . This approach resembles the DMELs (Derived Minimal Effect Levels) approach under REACH, aimed to minimise potential human health risks specifically for allergen exposure, and should be applied to potent sensitising agents with large populations at risk. A similar approach should be developed for use at the EU level in order to ensure similar protection of workers in each of the member states. The rationale for surveillance of occupational respiratory diseases is prevention. Prevention aims, ideally, to eliminate or reduce exposure to occupational risks to avoid any subsequent disease onset (primary prevention) and, when not possible, to detect any disease at a pre-clinical stage to reduce its severity and progression (secondary prevention). Finally, interventions to support and manage workers who have already developed a disease (e.g. physical rehabilitation or redeployment) aim to avoid disease complications and socioeconomic costs (tertiary prevention). Hence, surveillance is an important integrated part of the occupational healthcare chain, requiring an interdisciplinary approach in which healthcare professionals, occupational hygienists, employers, employees and authorities have to collaborate [99, 100]. The overall goal is to reduce the incidence of work-related diseases, to minimise the consequences of the disease in already affected workers, and to support participation and continuity in work. In the ageing workforce of today, medical surveillance is increasingly relevant and should be regarded as good occupational health practice. The chain described above shows both the potential strength and weakness of surveillance programmes, because these programmes, and interventions based on them, are not always directed by the same governmental authority. The importance of the chain is illustrated by the Coal Workers' Health Surveillance Program (CWHSP) in the USA, which is managed by the National Institute for Occupational Safety and Health in the US Department of Health and Human Services. After a dramatic drop in the prevalence of progressive massive fibrosis (PMF), the most severe form of coal workers' pneumoconiosis (CWP), since the start of the programme more than 40 years ago, a constant increase in prevalence among those screened has been observed from 1999 onwards. Miners develop CWP and PMF as a result of over-exposure to coal mine dust, so documentation of cases through medical screening and analysis of population data provided strong evidence that exposure control efforts were insufficiently protective . This information helped to motivate efforts to strengthen protection through the 2014 Coal Mine Dust Rule, which was developed and is enforced by the Mine Safety and Health Administration in the US Department of Labor. Most surveillance programmes are nowadays concerned with occupational asthma. Favourable effects have been reported on health outcome parameters, disability and socioeconomic costs . In workers with occupational asthma, removal from exposure improved asthma symptoms and lung function compared with continued exposure, but also increased the risk of job loss . As the overall quality of evidence on the effectiveness of surveillance programmes is low and most studies focused on components of surveillance rather than on the outcomes of an integrated programme, it is not possible to compare the differences in effects and cost-effectiveness or to generalise the effects to other work-related diseases. An important issue in the prevention and management of occupational asthma cases is thus the intervention strategy. Although prompt removal from the causal occupational exposure after diagnosis seems to offer the best prognosis , a recent longitudinal study in workers with allergy to platinum salts has shown that asthma may persist despite exposure reduction measures or job change . Consequently, removal from work of sensitised workers before they develop allergic symptoms was suggested as an alternative approach . Although the need for randomised controlled trials addressing these issues is obvious, these studies are not only difficult to execute in the work place but also raise an important ethical dilemma. Surveillance programmes are aimed at specific health risks related to potential occupational exposure. For work-related diseases with a long latency such as lung cancer, which often occurs after retirement age, early detection may be inappropriate and all efforts should focus on primary prevention of exposure to the causing agents. For short-latency respiratory diseases, such as asthma, early detection and intervention may prevent progression of disease and may help to keep the patients at work. The tools used in early detection should be tailor-made and the yield should be weighed against the costs and burden for the workers and the likelihood of false-negative and false-positive findings. Diagnostic modelling may help to select or exclude workers at high risk and may thus meet the drawbacks of investigating all workers and a high number of workers with a negative result. For example, predictive models have been developed and validated for bakers and construction workers and justify further studies to explore their usefulness as a component of surveillance programmes [103, 104]. However, as long as occupational health surveillance is perceived as a cost only, at least in the short term, and as a threat of claims in the future, employers and their organisations will be reluctant to cooperate in executing these programmes. In addition, national authorities have deregulated occupational health, thus shifting responsibility towards the employers and inducing conflicts of interest with economic goals of companies. Moreover, employers who invest in surveillance programmes will not necessarily benefit from reduced costs for medical care and sick leave. Controversially, for employers, the healthy worker effect (i.e. the survival of the “fittest” workers in the workforce) may thus be rewarding. In addition, without social protection in the case of unemployment, employees will hesitate to participate. Hence, without awareness and understanding of the important short- and long-term benefits of occupational health surveillance, setting up, implementing and evaluating surveillance programmes remains a challenge for all parties involved. Many changes have occurred in the industrial organisation of Western countries from fewer large and homogeneous manufacturing units towards a heterogeneous and complex service industry with many small enterprises where implementation and enforcement of health and safety regulations might be more challenging. In addition, the workforce has changed: the increased employment in the so-called “dirty jobs” of women (whereas OELs have generally been set based on evidence in men only), immigrants (often forced to work in unsafe conditions because of fear of job loss and deportation), people with pre-existing respiratory diseases and allergy (before being screened out from the workforce at the pre-employment health check) and older people (often with multiple chronic health conditions) has changed the dynamics of the discussion on occupational respiratory diseases. In particular, the ageing population in Western countries is changing the classical occupational respiratory disease agenda. Traditionally, the focus was only on prevention (through interventions and exposure reduction), early disease identification (through health surveillance) and compensation. Nowadays, with older people staying in the workforce, some of whom have already developed (work- or not work-related) respiratory diseases, the focus should also shift towards keeping people at work as long as possible and as healthy and fit as possible. This means that any healthcare professional (in particular respiratory physicians) may need to have more knowledge about the interaction between disease and the work environment and which factors in the work environment may lead to worsening of respiratory diseases even when they are not work-related. For example, smoking-related COPD patients might still work in a bakery and this requires specific monitoring approaches. Thus, there is a need for dissemination of knowledge on work-related exposure and respiratory health risks to professionals beyond the occupational respiratory health community. In addition, important advances in the treatment of diseases once considered rare and with short life expectancy (e.g. cystic fibrosis) have increased the presence in the labour force of “susceptible individuals”, thus challenging the traditional stereotype of workers as “healthier and fitter” than the general population. This issue would require new agreed guidelines to properly advise occupational health providers, employees and employers on the most appropriate job selection and health and safety management. The important increase in immigrant workers in the labour force poses additional social and ethical issues. Most of these workers are “vulnerable” subjects because of low social class, low education level, language and cultural barriers, and short-term contracts. They are thus likely not to have access to health surveillance and safety education and training. They are even at risk of becoming victims of modern work “slavery” or labour exploitation. Specific strategies to assist these workers should be implemented, in particular in “dusty” sectors such as construction where it is more likely that they are employed in the most hazardous jobs or tasks at the same time as being deprived of a proper education and training. The classical occupational healthcare model, led by occupational physicians and supported by nurses and occupational hygienists and other specialists, is under pressure in most European countries. The associated costs have become too high for many smaller and medium-sized enterprises. The need for health surveillance in high-risk industries is still pivotal, but this could be delivered through alternative and often cheaper surveillance methods that take advantage of web-based approaches, such as internet technology (e.g. e-health and telemedicine) and online medical diagnostic and prognostic algorithms . However, these approaches have only been developed in a few industries and there is a need for research to fill this gap with specific surveillance development projects in high-risk industries. This requires collaboration between occupational respiratory physicians, epidemiologists and industry. Increasing deregulation during the last decades has changed the landscape in occupational medicine considerably. In almost all European countries, national governments have limited their activities in this public health domain, and employers and employees, in particular the former, have now a greater responsibility in supplying and maintaining a healthy work environment. This deregulation is an area of political controversy in some member states of the EU. However, because of the limited role of national governments, decreased legislative control has changed the playing field for occupational health professionals considerably. A problem in the field of occupational respiratory diseases is that the costs associated with the burden of disease are not being paid by “the polluter”, a principle known from environmental health and hygiene, but often by national health or social security systems . In parallel, the regulator's health and safety inspectorate should continue and in some high-risk sectors strengthen their activity to ensure that employers respect the OELs already in force. Standards that have to be set under REACH for chemical substances and that describe safe levels of these substances in the air have now been increasingly derived by employers. In several countries, occupational standards are being proposed by public bodies only for some carcinogens, not for irritants or sensitising agents. Over the past decade, exposure–response relationships have been published for many occupational allergens, indicating that the risk of becoming sensitised is reduced at lower allergen exposure levels. Hence, there is a need for setting standards for sensitising agents according to a common evidence-based protocol. In the absence of an agreed standard, the precautionary principle “as low as reasonably achievable” should be followed. Implementation of proposed exposure standards is a slow process. Although recent scientific knowledge indicates that work-related allergies, including allergic asthma, can be prevented by limiting exposure to allergens, no initiatives exist to promote the derivation of occupational standards for respiratory allergens. Creating a clear link between contribution to occupational disease burden and public and private costs can potentially accelerate the introduction of occupational exposure standards. There is a need for a coherent occupational respiratory health agenda for the coming years. Regulatory issues (i.e. occupational exposure standards) should be evidence based, make use of the latest scientific insights, and protect the worker from developing respiratory disease. Many standards take into account the socioeconomic aspects, which is understandable. However, health-based evidence and a standard and transparent methodology are needed to develop science-based OELs versus consensus-based exposure limits. The latter will never fully protect the workforce from developing occupational respiratory diseases. There is a need to develop occupational standards for old and new respiratory hazards, including chemicals as well as biological agents acting both as irritants and sensitisers. The occupational respiratory health agenda should also cover novel approaches in occupational healthcare (e.g. using e-health and medical algorithms), which are expected to become more important in the near future. This requires analysis of existing surveillance data and novel projects in high-risk industries. It should be made possible to start up such projects with funding from industry, governmental bodies (EU Labour Directorate) in collaboration with the European Respiratory Society (ERS) Research Agency and focus groups of ERS members with adequate expertise. The occupational respiratory health field falls behind in these developments in comparison with other areas of healthcare. A research agenda in these areas is urgently needed. Finally, there is a need for more efficient e-tools to support respiratory health professionals. Many respiratory physicians have little knowledge about occupational respiratory hazards. Awareness of these exposures is crucial for a correct diagnostic work-up and so recognition of the occupational causation of the respiratory disease. In particular, determining to which hazardous respiratory agents workers are exposed, on the basis of next-generation “job or task exposure matrices”, can be a helpful way to support respiratory professionals. Such effective and efficient tools will help healthcare professionals correctly identify the causes of respiratory diseases, if made accessible for routine clinical practice. Author contributions: D. Heederik, S. De Matteis and T. Sigsgaard organised the workshop and drafted the initial manuscript. A. Burdorf, J. Rooijackers, P.K. Henneberger, T. Santonen and V. Schlünssen contributed to drafting the manuscript. All authors gave presentations during the workshop, critically reviewed the draft and approved the final version of the manuscript. This report is the result of a two-day workshop in Brussels, Belgium, organised by the European Respiratory Society Environment and Health Committee, with the aim of presenting an overview of the new challenges in the field of occupational respiratory diseases. The findings and conclusions in this report are those of the authors and do not necessarily represent the views of the National Institute for Occupational Safety and Health or the International Agency for Research on Cancer. The content of this work is not subject to copyright. Design and branding are copyright ©ERS 2017.
, et al. Asthma and exposure to cleaning products – a European Academy of Allergy and Clinical Immunology task force consensus statement. Allergy 2013; 68: 1532–1545. , et al. SWORD '99: surveillance of work-related and occupational respiratory disease in the UK. Occup Med 2001; 51: 204–208. , et al. Trends in incidence of occupational asthma, contact dermatitis, noise-induced hearing loss, carpal tunnel syndrome and upper limb musculoskeletal disorders in European countries from 2000 to 2012. Occup Environ Med 2015; 72: 294–303. , et al. EAACI position paper: irritant-induced asthma. Allergy 2014; 69: 1141–1153.
. Occupational asthma in cleaners: a challenging black box. Occup Environ Med 2015; 72: 755–756.
. Occupation and COPD: a brief review. J Asthma 2012; 49: 2–4. , et al. Occupations associated with COPD risk in the large population-based UK Biobank cohort study. Occup Environ Med 2016; 73: 378–384. , et al. Occupational exposures are associated with worse morbidity in patients with chronic obstructive pulmonary disease. Am J Respir Crit Care Med 2015; 191: 557–565. , et al. Environmental triggers of COPD symptoms: a case cross-over study. BMJ Open Respir Res 2017; 4: e000179.
. Eliminating Occupational Cancer in Europe and Globally. ETUI Working Paper 2015.10. Available from: http://dx.doi.org/10.2139/ssrn.2681092 Date last updated: October 27, 2015.
, Forouzanfar MH, Alexander L, et al. Global, regional, and national comparative risk assessment of 79 behavioural, environmental and occupational, and metabolic risks or clusters of risks in 188 countries, 1990–2013: a systematic analysis for the Global Burden of Disease Study 2013. Lancet 2015; 386: 2287–2323. , et al. The European mesothelioma epidemic. Br J Cancer 1999; 79: 666–672.
. Pleural mesothelioma in Sweden: an analysis of the incidence according to the use of asbestos. Occup Environ Med 1999; 56: 110–113. , et al. The global burden of disease due to occupational carcinogens. Am J Ind Med 2005; 48: 419–431. , et al. Asbestos and cancer: an overview of current trends in Europe. Environ Health Perspect 1999; 107: Suppl. 2, 289–298. , et al. Occupational exposure to carcinogens and risk of lung cancer: results from The Netherlands cohort study. Occup Environ Med 1997; 54: 817–824. , et al. Exposure–response analyses of asbestos and lung cancer subtypes in a pooled analysis of case–control studies. Epidemiology 2017; 28: 288–299. , et al., eds. Occupational lung diseases. In: The European Lung White Book. Sheffield, European Respiratory Society, 2013; pp. 282–295. , et al. SYN-JEM: a quantitative job-exposure matrix for five lung carcinogens. Ann Occup Hyg 2016; 60: 795–811. , et al. Excessive exposure to silica in the US construction industry. Ann Occup Hyg 2003; 47: 111–122. , et al. Effectiveness of a multidimensional randomized control intervention to reduce quartz exposure among construction workers. Ann Occup Hyg 2015; 59: 959–971. , et al. Occupation and cancer in Britain. Br J Cancer 2010; 102: 1428–1437. , et al. Influence of poor health on exit from paid employment: a systematic review. Occup Environ Med 2014; 71: 295–301. , et al. Lost working years due to mental disorders: an analysis of the Norwegian disability pension registry. PLoS One 2012; 7: e42567. , et al. An international prospective general population-based study of respiratory work disability. Thorax 2009; 64: 339–344. , et al. Occupational exposures and uncontrolled adult-onset asthma in the European Community Respiratory Health Survey II. Eur Respir J 2014; 43: 374–386. , et al. The influence of chronic health problems and work-related factors on loss of paid employment among older workers. J Epidemiol Community Health 2015; 69: 1058–1065. , et al. Interaction effect of psychological distress and asthma control on productivity loss? Eur Respir J 2015; 45: 1557–1565. , et al. International ERS/ATS guidelines on definition, evaluation and treatment of severe asthma. Eur Respir J 2014; 43: 343–373. , et al. A review of national guidelines for management of COPD in Europe. Eur Respir J 2016; 47: 625–637. , et al. Human exposure to carbon-based fibrous nanomaterials: a review. Int J Hyg Environ Health 2016; 219: 166–175. , et al. Nanoparticles from photocopiers induce oxidative stress and upper respiratory tract inflammation in healthy volunteers. Nanotoxicology 2013; 7: 1014–1027.
. Molecular mechanisms underpinning laser printer and photocopier induced symptoms, including chronic fatigue syndrome and respiratory tract hyperresponsiveness: pharmacological treatment with cinnamon and hydrogen. Neuro Endocrinol Lett 2013; 34: 723–737. , et al. Carcinogenicity of fluoro-edenite, silicon carbide fibres and whiskers, and carbon nanotubes. Lancet Oncol 2014; 15: 1427–1428. , et al. Role of oxidative stress in carbon nanotube-generated health effects. Arch Toxicol 2014; 88: 1939–1964.
. Occupational asthma. N Engl J Med 2014; 370: 640–649. , et al. Cleaning and disinfecting environmental surfaces in health care: toward an integrated framework for infection and occupational illness prevention. Am J Infect Control 2015; 43: 424–434. , et al. A refined QSAR model for prediction of chemical asthma hazard. Occup Med 2015; 65: 659–666. , et al. New-onset asthma associated with exposure to 3-amino-5-mercapto-1,2,4-triazole. J Occup Environ Med 2004; 46: 1246–1252.
. Recognizing occupational effects of diacetyl: what can we learn from this history? Toxicology 2016; 388: 48–54. , et al. Bronchiolitis obliterans syndrome in chemical workers producing diacetyl for food flavorings. Am J Respir Crit Care Med 2007; 176: 498–504. , et al. Pulmonary fibrosis in an individual occupationally exposed to inhaled indium-tin oxide. Eur Respir J 2005; 25: 200–204. , et al. Interstitial pneumonia developed in a worker dealing with particles containing indium-tin oxide. J Occup Health 2003; 45: 137–139. , et al. Carcinogenicity of welding, molybdenum trioxide, and indium tin oxide. Lancet Oncol 2017; 18: 581–582. , et al. Artificial stone silicosis [corrected]: disease resurgence among artificial stone workers. Chest 2012; 142: 419–424. , et al. Outbreak of silicosis in Spanish quartz conglomerate workers. Int J Occup Environ Health 2014; 20: 26–32.
. Denim production and silicosis. Curr Opin Pulm Med 2016; 22: 165–169. , et al. Silicosis caused by sandblasting of jeans in Turkey: a report of two concomitant cases. J Occup Health 2005; 47: 346–349.
. Risk assessment of silicosis and lung cancer among construction workers exposed to respirable quartz. Scand J Work Environ Health 2005; 31: Suppl. 2, 49–56. , et al. Respirable quartz dust exposure and airway obstruction: a systematic review and meta-analysis. Occup Environ Med 2014; 71: 583–589. , et al. The avoidable future burden of COPD due to occupational respirable christalline silica in the EU. Occup Environ Med 2016; 73: Suppl. 1, A1–A250. , et al. Prioritising action on occupational carcinogens in Europe: a socioeconomic and health impact assessment. Br J Cancer 2017; 117: 274–281. , et al. Resurgence of progressive massive fibrosis in coal miners – Eastern Kentucky, 2016. MMWR Morb Mortal Wkly Rep 2016; 65: 1385–1389.
. Resurgence of a debilitating and entirely preventable respiratory disease among working coal miners. Am J Respir Crit Care Med 2014; 190: 708–709. , et al. Mortality in miners with coal-workers’ pneumoconiosis in the Czech Republic in the period 1992–2013. Int J Environ Res Public Health 2017; 14: E269. , et al. Climate change and respiratory diseases. Eur Respir Rev 2014; 23: 161–169.
. Asthma caused by occupational exposures is common – a systematic analysis of estimates of the population-attributable fraction. BMC Pulm Med 2009; 9: 7.
, et al. An official American Thoracic Society statement: work-exacerbated asthma. Am J Respir Crit Care Med 2011; 184: 368–378. , et al. The occupational contribution to severe exacerbation of asthma. Eur Respir J 2010; 36: 743–750. , et al. Socioeconomic outcome of subjects experiencing asthma symptoms at work. Eur Respir J 2002; 19: 1107–1113. , et al. Outcome of subjects diagnosed with occupational asthma and work-aggravated asthma after removal from exposure. J Occup Environ Med 2006; 48: 656–659. , et al. Work-exacerbated asthma and occupational asthma: do they really differ? J Allergy Clin Immunol 2013; 131: 704–710. , et al. A descriptive study of work aggravated asthma. Occup Environ Med 2004; 61: 512–517.
. Socioeconomic outcomes in work-exacerbated asthma. Curr Opin Allergy Clin Immunol 2007; 7: 236–241. , et al. Trends in occupations and work sectors among patients with work-related asthma at a Canadian tertiary care clinic. Chest 2016; 150: 811–818. , et al. Consequences of asthma on job absenteeism and job retention. Scand J Public Health 2012; 40: 377–384. , et al. Prevalence of work-related asthma and its impact in primary health care. Arch Bronconeumol 2015; 51: 449–455. , et al., eds. Adult asthma. In: The European Lung White Book. Sheffield, European Respiratory Society, 2013; pp. 138–147. , et al. O46-2 Development of an asthma-specific job exposure matrix for use in the United States. Occup Environ Med 2016; 73: A87. , et al. Emission of particulate matter from a desktop three-dimensional (3D) printer. J Toxicol Environ Health A 2016; 79: 453–465. , et al. Evaluation of occupational disease surveillance in six EU countries. Occup Med 2010; 60: 509–516. , et al. Management of occupational asthma: cessation or reduction of exposure? A systematic review of available evidence. Eur Respir J 2011; 38: 804–811. , et al. Gene–environment interactions in asthma. Occup Environ Med 2006; 63: 776–786.
. The role of genetic factors in occupational asthma. Eur Respir J 2003; 22: 173–178. , et al. Employment and work disability in adults with cystic fibrosis. J Cyst Fibros 2012; 11: 137–143. , et al. S and Z alpha1-antitrypsin alleles are risk factors for bronchial hyperresponsiveness in young farmers: an example of gene/environment interaction. Eur Respir J 2000; 16: 50–55. , et al. Low normal alpha-1-antitrypsin serum concentrations and MZ-phenotype are associated with byssinosis and familial allergy in cotton mill workers. Pharmacogenetics 1994; 4: 135–141. , et al. Alpha-1 antitrypsin deficiency PI*Z and PI*S gene frequency distribution using on maps of the world by an Inverse Distance Weighting (IDW) multivariate interpolation method. Hepat Mon 2012; 12: e7434. , et al. Early life origins of chronic obstructive pulmonary disease. Thorax 2010; 65: 14–20. , et al. Prenatal maternal stress and atopic diseases in the child: a systematic review of observational human studies. Allergy 2016; 71: 15–26. , et al. Prenatal maternal psychological stress and childhood asthma and wheezing: a meta-analysis. Eur Respir J 2016; 47: 133–146. , et al. Maternal occupational exposure to asthmogens during pregnancy and risk of asthma in 7-year-old children: a cohort study. BMJ Open 2013; 3: e002401. , et al. Occupational health policy and immigrant workers in the agriculture, forestry, and fishing sector. Am J Ind Med 2013; 56: 975–984. , et al. Priorities for development of research methods in occupational cancer. Environ Health Perspect 2003; 111: 1–12. , et al. The global landscape of occupational exposure limits – implementation of harmonization principles to guide limit selection. J Occup Environ Hyg 2015; 12: Suppl. 1, S127–S144.
. A comparison of REACH-derived no-effect levels for workers with EU indicative occupational exposure limit values and national limit values in Finland. Ann Occup Hyg 2015; 59: 401–415.
. Derived no-effect levels (DNELs) under the European chemicals regulation REACH – an analysis of long-term inhalation worker-DNELs presented by industry. Ann Occup Hyg 2015; 59: 416–438.
. Recommendation from the Scientific Committee on Occupational Exposure Limits for Silica, Crystalline (respirable dust). SCOEL/SUM/94. 2003.
, et al. Exposure to crystalline silica, silicosis, and lung disease other than cancer in diatomaceous earth industry workers: a quantitative risk assessment. Occup Environ Med 2002; 59: 36–43. , et al. Exposure–response analyses for platinum salt-exposed workers and sensitization: a retrospective cohort study among newly exposed workers using routinely collected surveillance data. J Allergy Clin Immunol 2016; 137: 922–929.
. Wheat sensitization and work-related symptoms in the baking industry are preventable. An epidemiologic study. Am J Respir Crit Care Med 1998; 158: 1499–1503. , et al. Exposure–sensitization relationship for alpha-amylase allergens in the baking industry. Am J Respir Crit Care Med 1996; 154: 130–136. , et al. Prevention of work-related airway allergies; summary of the advice from the Health Council of the Netherlands. Allergy 2008; 63: 1593–1596.
. Medical surveillance for prevention of occupational asthma. Curr Opin Allergy Clin Immunol 2013; 13: 138–144. , et al. What are the benefits of medical screening and surveillance? Eur Respir Rev 2012; 21: 105–111. , et al. Workplace interventions for treatment of occupational asthma. Cochrane Database Syst Rev 2011; 5: CD006308. , et al. Medical surveillance and long-term prognosis of occupational allergy due to platinum salts. Int Arch Occup Environ Health 2017; 90: 73–81. , et al. Application of a prediction model for work-related sensitisation in bakery workers. Eur Respir J 2010; 36: 735–742. , et al. A simple diagnostic model for ruling out pneumoconiosis among construction workers. Occup Environ Med 2007; 64: 595–601. , et al. Cost–benefit analysis in occupational health: a comparison of intervention scenarios for occupational asthma and rhinitis among bakery workers. Occup Environ Med 2011; 68: 739–745.